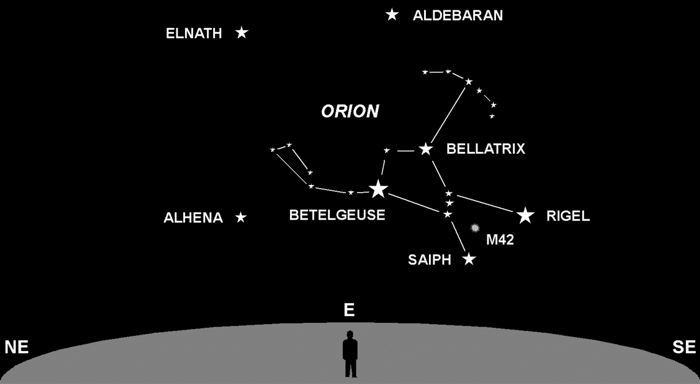 Orion the Hunter is one of the few constellations that appear as an easily recognized shape. He really looks like a hunter, and the stars that comprise him include some of the brightest in the sky. His bow and club are made of fainter stars, but can still be seen on clear dark nights. One interesting feature is the vivid contrast in color between the stars Betelgeuse (red) and Rigel (blue). The color of a star is a function of its temperature. Betelgeuse is a cool 3000 °C, Rigel a scorching 12,000 °C. For comparison, the surface temperature of our Sun is in the average range of 6000 °C (that’s about 10,800 °F). Yet another highlight is M42 (a.k.a. the Orion Nebula). This feature is best enjoyed through binoculars or telescopes, but is visible to the unaided eye. The Nebula is a gigantic cloud of gas in which new stars are being formed. It is a stellar nursery, if you will, containing some of the youngest stars in our cosmic neighborhood — a mere one million years old. For comparison again, our Sun is estimated to be 4.5 billion years old. Orion is the most prominent winter constellation, rising in the east now at sunset, staying up all night, and setting in the west around dawn.